‘Meta’ means to change and ‘morph’ refers to shape or form; hence, meta-morphosis points to a change in form or shape. 2018, with its numerous planetary retrogrades and being a numerological ‘2’ cycle, could have been experienced by many as deeply introspective, slow-moving, of heightened sensitivity or even a frustrating time of seemingly prolonged inertia and passivity. I am told that, contrary to our conscious awareness, complex cellular re-programming has, in fact, been taking place in our chakra and other subtle bodies throughout the year, in response to the ascension codes released through the Earth’s energy grids. 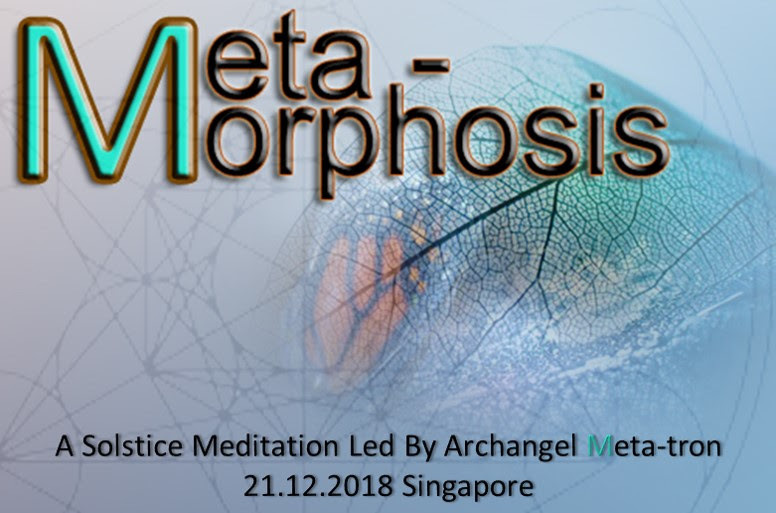 Like a chrysalis in complete stillness, we – embodiment of the star human consciousness – are being morphed into the higher expressions of our soul. As 2018 draws to a close, it is time to celebrate the completion of this crucial alchemical transformation deep within our bodies. Let us come together this Solstice to honour and welcome the emerging butterfly in all of us! Who and what is Meta-tron? Galactic ascension programs embedded in 2018: what were they?